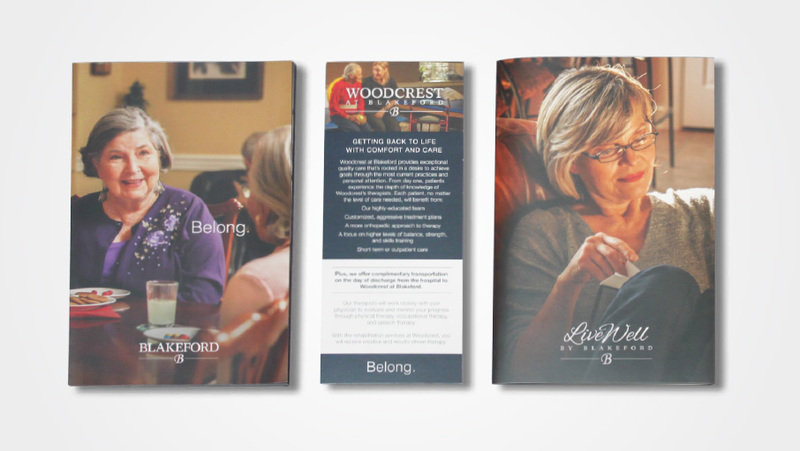 Blakeford is a non-profit continuing care retirement community and the gold standard of quality care, ethical performance, and service within the industry. The only facility in Middle Tennessee to receive CARF-CCAC accreditation, Blakeford offers innovative, independent living service and long-term care insurance. With a new strategy, vision, and enhanced services, Blakeford required a brand presence that mirrored the quality and innovation they offer. Teaming up with Blakeford, Phase 3 recognized the opportunity to communicate one consistent brand narrative to multiple audiences. Phase 3 provided Blakeford with a winning roadmap by conducting competitive analyses and secret shopping sessions to determine the approaches, strengths, and weaknesses of competitor CCRCs. This resulted in a unified identity system and new website housing all Blakeford entities under one seamless brand presence. With Blakeford’s exceptional service in mind, Phase 3 wanted to reflect Blakeford’s unparalleled client experience by capturing and securing authentic photography of its unique Green Hills, Nashville location for future residences to admire. The Blakeford way is all about being who you are, living the way you want, where you want. This sense of belonging reflects the high quality of life available at their facilities and within their programs. A new website, fresh collateral, and renewed social assets simply amplified and unified this brand approach through tradeshow materials, direct mail, and internal signage. Blakeford now offers a consistent and meaningful experience that measurably sets their brand above all competitors.